Kapisanan Philippine Centre for Arts & Culture/Blog/SO YOU THINK YOU CAN DANCE?! Here's your chance to prove it. All levels and ages welcome. 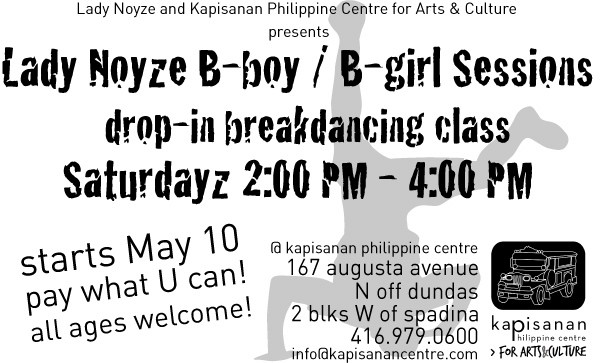 Come chill with Lady Noyze the premiere b-girl in the T dot. word. Starts May 10 every Saturday (except for May 17th long weekend) 2pm-4pm @ guess where??? KPC 167 Augusta Avenue.